We hope this will not only help you become a better investor, but also enhance your riches over the years. With a little magic that the number '7' weaves for you. As ET Wealth completes seven years this December, it's a good time to get acquainted with George Miller. In 1956, the Princeton psychologist figured out the magic of number '7'. He theorised that the number of objects an average person can remember is 7. It is probably the reason financial experts recommend that you should not have more than 7-8 funds in your portfolio. But it doesn't quite explain why equity investment for over seven years brings down the probability of loss. Or why the world is governed by 7, from the colours in a rainbow to days in a week and notes in music. Or even the reason why the proverbial seven-year itch sets in a marriage. What it has done is help us figure out the magic of number '7' when it comes to personal finance. The itches that can set in if you ignore the crucial periods of financial decision-making. 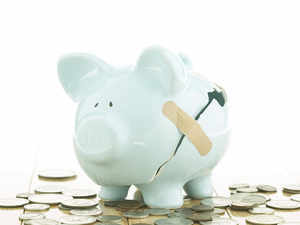 The liabilities you can incur, the retirement kitty you can run out of, the mistakes that can bloat into losses, the loans that can become difficult to manage, or the children who can grow up to make flawed financial decisions because you didn't teach them money skills at the right age. These periods may not be a precise seven years, but hover around this magic number. "There are many such rules and calculations built around the number '7' in finance. For instance, it has been observed that if the market suffers a 7-10% dip, it is bound to witness a steep correction," says Priya Sunder, Director, PeakAlpha Investment Services. While we do not aim to scour for all such rules or periods, we do intend to tell you how to avoid the problems you are likely to face. Go through the following pages to understand how to take the right financial decisions during specific periods in your life, be it after getting a job or having children, after retirement or while investing in equity. We hope it will not only help you become a better investor, but also enhance your riches over the years. With a little magic that the number '7' weaves for you. This is an itch that is consistently suffered by most investors and is well-documented. If you invest in the market in the form of stocks or mutual funds for short durations, or buy and sell erratically while trying to time the market, there is a good chance that your portfolio will be in the negative. This is because it has been proven historically that if you remain invested for at least 7-8 years, your chances of making a loss are minimal. Staying invested in equity for more than 7-8 years diminishes the probability of loss considerably, while that of making gains increases dramatically. This has been observed in an analysis of equity funds in the Indian market between 2007 and 2017, where the probability of loss reduced to zero beyond seven years. "In fact, if you look at any block of seven years in the market, you wouldn't have lost money," says Sunder. Similarly, an analysis of data from developed equity markets between 1970 and 2017, by research and analytics firm Macrobond, suggests that the probability of loss falls beyond 7-8 years and drops to zero beyond 11.1 years. "We believe that short-term investments affect behavioural decision-making and leads to emotive reactions. 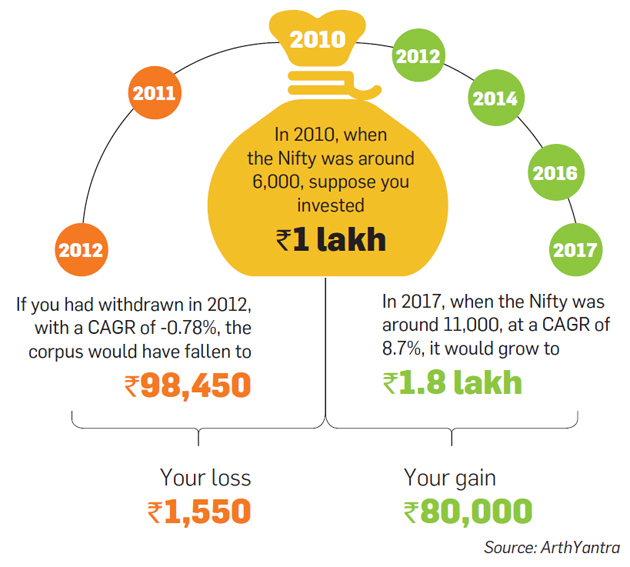 This means that you end up taking bad calls and fall prey to the vagaries of volatility," says Nitin Vyakaranam, Founder and CEO, ArthaYantra. "On the other hand, if you remain invested for 7-8 years, you behave in a less emotive manner. A longer-term investment also means that volatility reduces considerably, increasing your chances of gain," he adds. "The term of investment also depends on the goal," says Jayant Pai, Head, Marketing, PPFAS Asset Management. "If you start investing when your child is born, even 15 years may not be enough depending on the corpus you need. Or if you are trying to save for retirement in 20 years, but withdraw after 7-8 years because that is the optimum investment period, that also won't make sense." So if you have long-term goals, equity may be your best bet as it will ensure that you stay on course and don't incur a loss. In many ways, the first 7-8 years after you are employed and start earning are the most crucial and can decide the course of your entire financial journey. "The investor's biggest ally is time and there's no better time to start investing than to do it as early as possible," says Sunder. This is because you can take more risks, have greater flexibility to choose products, and have a better opportunity to save due to fewer liabilities at this stage in life. Besides, you can make your money grow through the power of compounding. Compounding means that the interest you earn on your savings keeps earning its own interest. 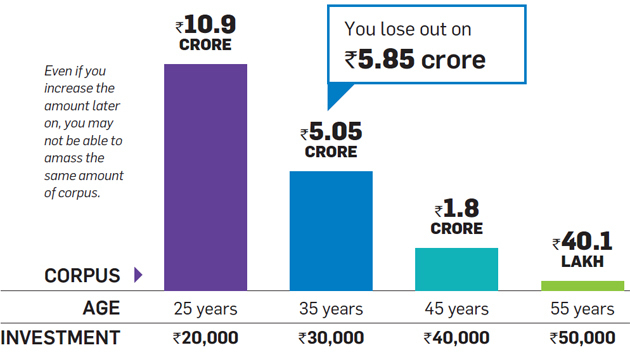 For instance, if a 25-year-old starts saving ₹ 2.4 lakh a year, he can build a corpus of ₹ 10.9 crore in 35 years at 12% return. However, if he doesn't start investing till he is 35, then to build the same corpus he will have to increase the investment nearly three times or will amass only one-third of the corpus. That is, he will be able to build only ₹ 3.4 crore instead of ₹ 10.9 crore. "However, compounding can take place only if you are aware of the right instruments and invest wisely. 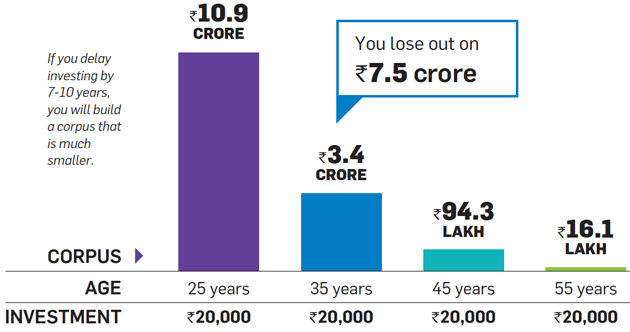 Investors in the age group of 21-29 years typically make the most number of financial mistakes," says Vyakaranam. This means that spending and not saving may be as bad as investing in avenues like traditional insurance policies or Ulips, which lead to wealth erosion. Since it takes more time to move your investments from the negative to positive rather than vice versa, it is important that you have time on your hands to recoup the losses if you make mistakes in the initial stages. Assumptions: Current age: 30 years; Retirement age: 60 years; Rate at which savings will grow: 12%. 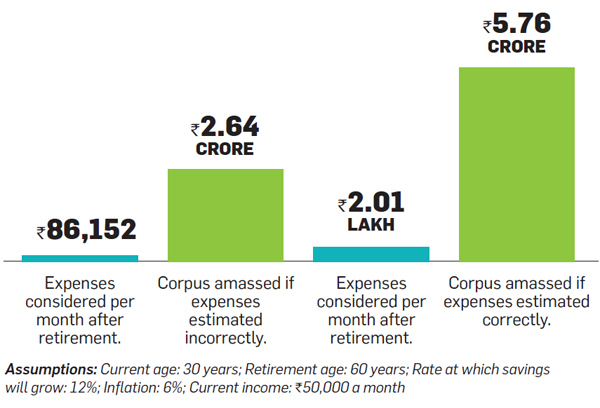 If you think your expenses will fall after retirement, think again. While kid-related expenditure and debt come down, there is a rise in medical and travel costs. This may result in an insufficient corpus that may not last too long. This can also happen if you ignore inflation, which leads to wealth erosion over time. "When you get a lump sum on retirement in the form of PF or gratuity, you are under the illusion that there is lot of money. 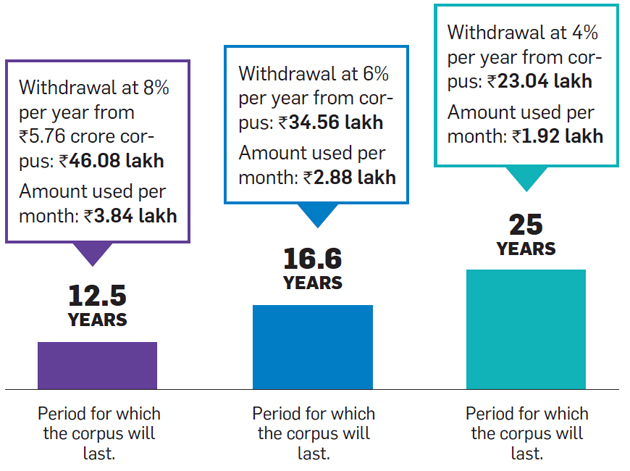 If you start withdrawing at the rate of 10%, even as the corpus grows at 7%, you will soon run out of money," says Sunder. The rise in survival rate also means that you will live longer. Hence, the need to withdraw at a rate lower than the one at which your money grows. Correct asset allocation is critical to ensuring that the corpus lasts longer. While you need to bring down the equity component to reduce risk, it is imperative that you invest in equity to beat inflation and make your money stretch. "Another problem is being houserich and money poor, wherein the parents may have to depend on children for money," says Sunder. Choosing tax-inefficient instruments also erodes the corpus, which is why fixed deposits may not be the best idea. Instead, go for balanced funds, which become tax-free after a year. How long will the money last if you withdraw more? Given that there is spate in medical problems after retirement, you should review your health insurance or have a sufficient buffer. As for life insurance, you will not need it unless you have dependants or there are maturity benefits, and can end it after retiring. It is important to start investing early for any financial goal; more so for children's education. If you don't start working on it in the first 7-8 years, you are likely to end up with an inadequate corpus. "It is typically the No. 1 goal for most parents, but not saving for it can impact them in so many ways since all the financial decisions are inter-connected. So if you have not saved enough for children's education, you may have to take loans and will end up increasing your liabilities," says Vyakaranam. Choosing the right instruments for investment is as crucial. "Do not buy life insurance for them, or any plan that has the word 'child' in it," says Pai. Go in for a diversified portfolio, with the right mix of equity and debt, depending on the time frame. The earlier you start investing, the easier it will be to reach your goal provided you choose the right instruments. 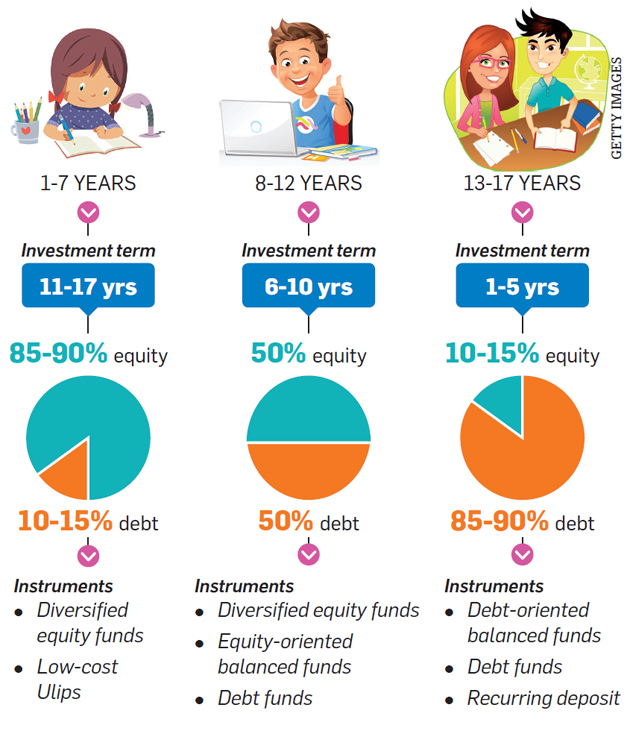 If you begin investing right after the child is born, you will have enough time to enjoy the high returns of equity funds. These are a good way to invest for children's goals as the risk is reduced considerably after seven years. They also offer high flexibility and the returns are tax-free after a year. If, however, you have delayed investment, you will have to opt for lowreturn instruments like debt-oriented funds or a recurring deposit. While these will ensure the safety of capital, you may not be able to amass the corpus you want. "If you are the sole earning member, it is a good idea to get some protection. Buying a Ulip, which also offers insurance, makes sense because it reduces the risk by ensuring that the premium is paid for even if you die," says Sunder. "Where you invest will also depend on how much money you can set aside at any given time," says Pai. If you have small amounts, go for mutual fund SIPs, but if you have a lump sum and want to buy real estate, you can do that too. But, remember not to binge on it and skew your portfolio as it is an illiquid asset. After buying the house, invest in equity. Income: If your cash flow doesn't allow you to pay a big EMI, you will have to take a smaller loan or for a longer duration. Remember that a home loan EMI should not exceed 40% of your total income. 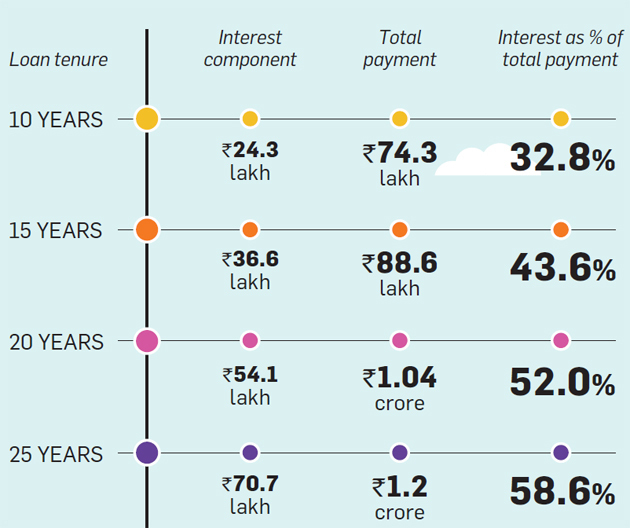 Interest rate: If you have a lump sum of ₹ 10 lakh and can either invest it or buy a car, the decision should be taken on the basis of the rate offered on the loan. "If the dealer gives you the loan at 7.5% and you can earn 12% on ₹ 10 lakh, you should take the loan," says Sunder. It's also important to remember that the interest outgo keeps increasing with the tenure of the loan. So if you take a home loan for 25 years, you could end up paying over 50% of the loan as interest. How much EMI should you pay? 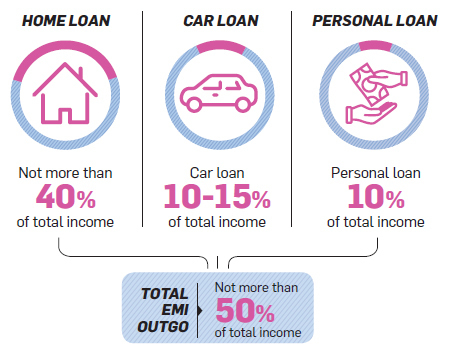 Tax benefit: While a home loan enjoys tax benefits, a car loan doesn't. A car is also a depreciating asset and it doesn't make sense to pay a high interest on it by taking a loan for a long duration. On the other hand, you get a ₹ 2 lakh tax deduction on interest in the case of a home loan. This amount is unlimited if the house in question is rented. It's probably one of the most important things to do during this period," says Pai. Agrees Vyakaranam: "We teach kids about everything except money. The school, too, doesn't help. This is the reason that when kids start working, they don't know what to do with their first pay cheques. The next generation is not going to have the tax incentives or optimal saving avenues that we currently do, and will need to handle the new eco-system differently." To be able to do so, parents need to start as early as possible. 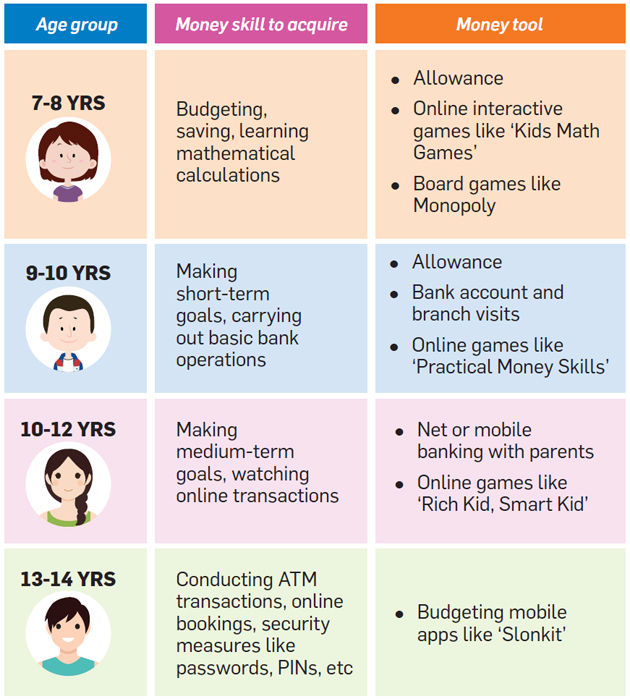 A recent study by the Cambridge University, England, suggests that most children's financial habits are formed by the time they are seven years old, implying that it may be too late to wait till they are in middle school to teach them money skills. However, seven may still be a good age to begin. You could start small, by giving your children an allowance and asking them to manage it. You can also teach them about basic concepts and mathematical calculations with the help of online and board games. Graduate slowly to actual transactions, complex dealings and better habits. "The important thing is to inculcate the right value system in the child," says Sunder. "You can't preach one thing and practise another," she adds. Pai concurs. "As parents, we need to check our financial habits because kids learn by observing. So if you buy a big car that you can't afford by taking a loan, the child will assume this is the only way to do it," he says. Money arguments in front of kids may also not be a good idea as differing viewpoints will confuse the kid.